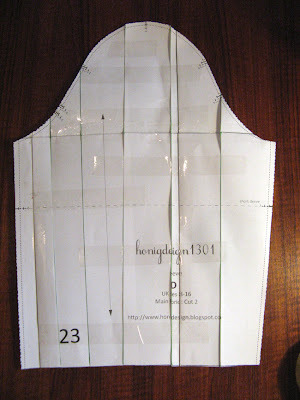 Cut out the sleeve pattern piece, and draw a few vertical parallel lines. Cut up to but not through the seamline at the sleeve cap. Now, if you want to make the sleeve narrower, simply move the pieces toward eachother so that they overlap. Or, spread them apart if you want to widen them. 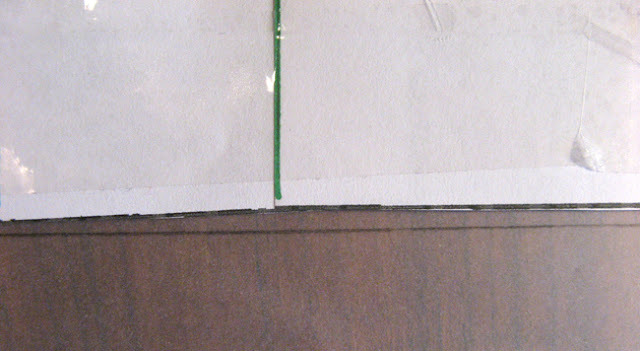 Glue or tape the bottom edge onto another piece of paper and straighten it out, using a ruler. 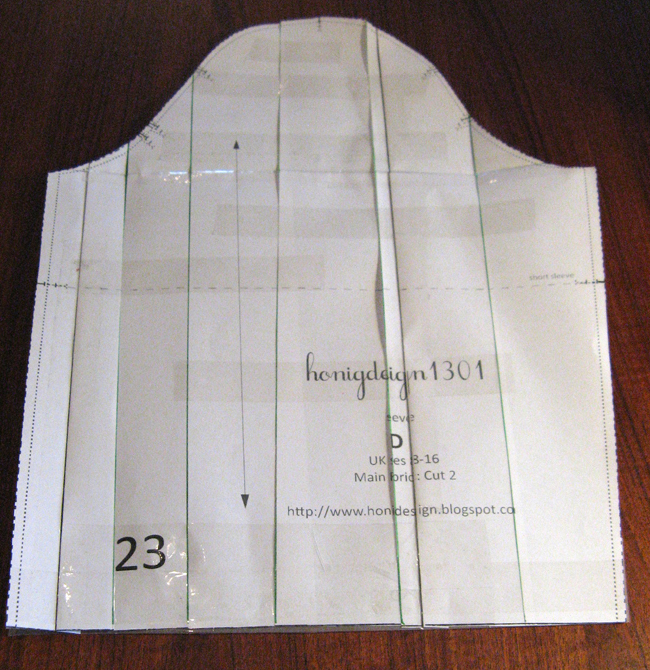 Trim away the excess and you have your full pattern piece. 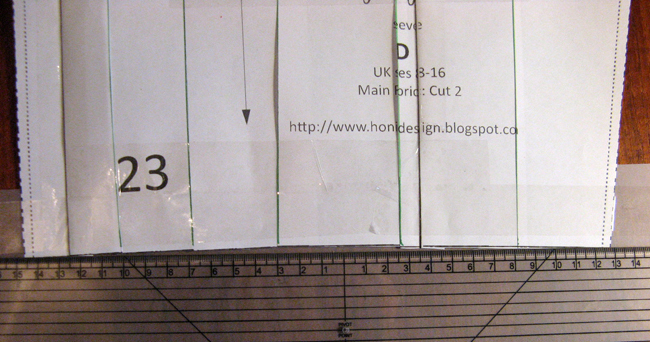 NB: Not shown here, you also need to redraw the grainline at a right angle to the sleeve hem. If you are widening, straighten out the bottom by lengthening the sleeve at each side, then draw a line across the bottom so that it meets the centre of the pattern piece, or your preferred length. I hope you find this tip useful for any pattern you sew! Hello - I just discovered your fab blog today via Pinterest. Love those dresses you've created. That lace insert is really cool. You have inspired me! Thank you for making patterns available and for giving tutorials on making changes. And also thank you for a list of other really great sewing/creating blogs. Look forward to reading all your posts. Already have a question: seams in armpits feel wierd and tight, and to low. I sew 16 size. I have big bust and non-stretch fabric, may it be couse of the problem? Should i add wight on the center or on the sider of bodice front detail? Thank u for you blog, and good luck from snowy russia! Useful! Thank you for sharing your technique. And I can't wait to see the different versions of your very cute GPD! Hello, I love your dress! I cannot download it for some reason :( can you tell me is there something special I need to do as I really want this pattern. Thanks so much. Hi Kalimah, thanks for your nice comment! Have you tried clearing the cookies on your computer? If that doesn't work send me an email and ill forward it to you. I was having the same issue, but was able to downloaded once I used the Google Chrome browser.